How are the objects doing? Are they in good condition? Are they in a particular order? Would you know who all those people are if an elder parent or cousin wasn’t there to tell you? 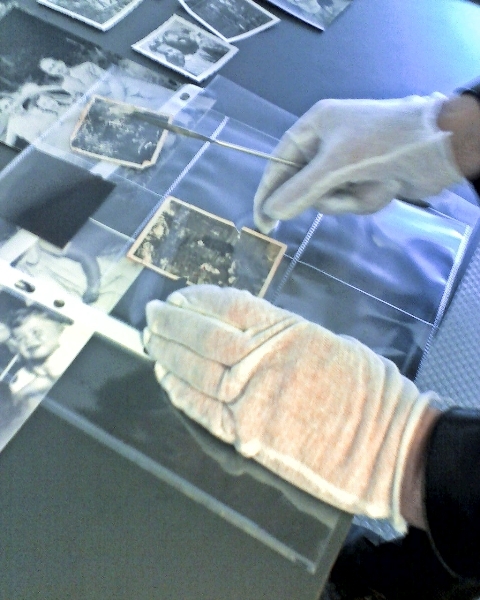 For photographs and film, do you know where the negatives are and if they can be associated with those pictures? Is there information such as names, dates, or places that can be read off of their envelopes or cans and transcribed in pencil to an album page or added onto a new label? For albums, do the album pages seem stable or are they crumbling or showing obvious deterioration? Are photo corners holding or coming loose and causing photos to slip around and into the margins? If so, do you have an opportunity to house them in a new acid-free album that is more appropriate for permanent storage? 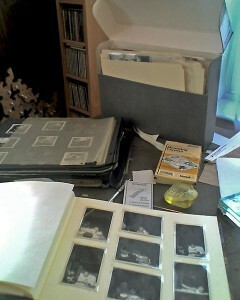 Might you think about selecting some of these to digitize so that everyone can have a copy? Over the past few months, we’ve been putting more and more tips up to address all of the above. Simply click here or on our “conservation” tag to pull up all our posts on this topic. You can also watch some clips we’ve released on our YouTube channel, follow our tips on our Facebook page, or check out the Archives Month lectures we’ve webcast that include tips on video and digital archives. Outside our pages, you can also follow the preservation of one family’s archive of love letters being treated at the Conservation Center for Art and Historic Artifacts where the one of the family members works. 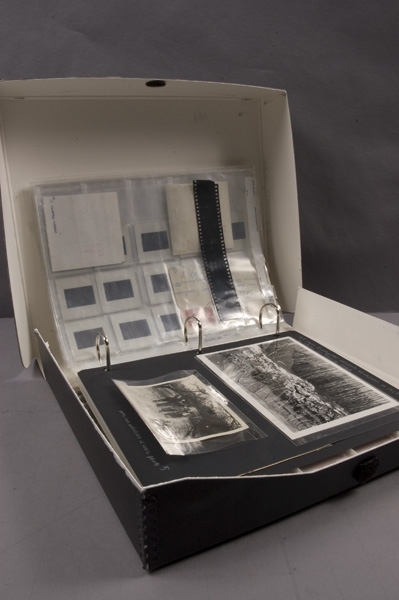 Our colleagues at the National Archives and Records Administration have some great tips on preserving family archives, and here’s one specifically on scrapbooks by the Florida State Archives (with great pictures). 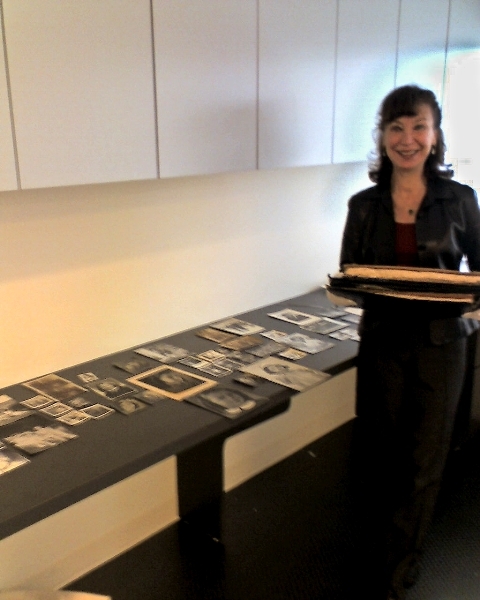 As an example, my mom who is retired and has a bit more free time than I do, came into work with me on the day after Thanksgiving in order to do a long-desired project—preservation rehousing of her own childhood photos. So I invited her to bring the most important album (a traditional black-page album with side-ties and small black and white photos) with her to my lab where I could show her how to use simple tools, such as a microspatula, gloves, and photo corners, but she could do the bulk of the work herself, while I took advantage of the quiet to close out some files and projects. 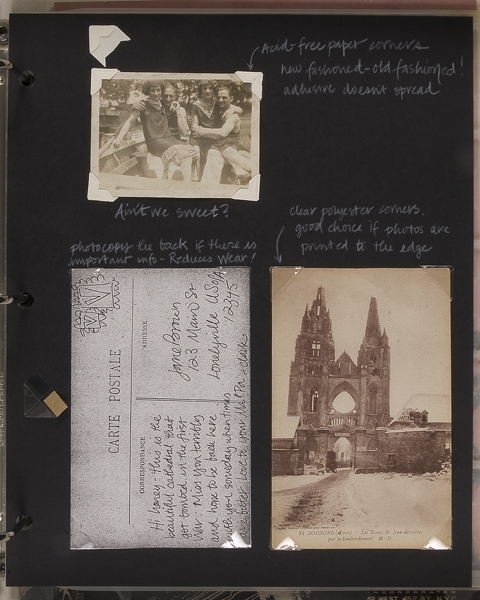 In under an hour, she became confident in handling, removing, and placing the vulnerable photos in new pages with Mylar photo pockets, and adding a place to transcribe and add descriptive information so that someday I can better remember these people and places. 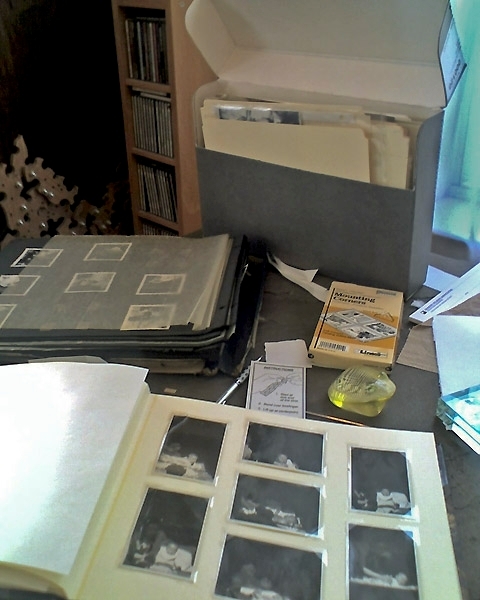 I rarely suggest taking apart an original album, especially if it has original handwriting and/or the photos or clippings are glued overall to a page. But in our case, the album was in very poor shape, and undistinctive. If it had been printed with names or dates, perhaps we would have saved at least the original covers. In contrast, see a discussion about another family’s album over on the Smithsonian Magazine blog, Around the Mall. Happy gatherings, everyone.